Jessica Simpson launched her line of sweet fragrances and cosmetics named Dessert Treats in 2004, delicious, attractive and irresistibly cute. 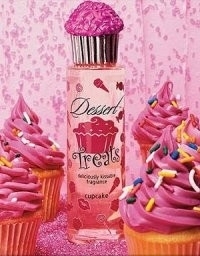 Dessert Treats Cupcake is a scent of cookies, seductive and fun. Notes: sugar and vanilla. Fabulous girly bottle, great to look at, nice girly scent. This is a great novelty perfume,it smells really sweet and tastes sweet,ye, it is edible. better suited to a young girl or child and price is really good too.